This has to be the most insane Rolls-Royce we’ve ever seen. Swedish skier and self-proclaimed gearhead Jon Olsson is well known for the custom cars he takes on automotive adventures. You may remember his previous projects such as the DTM-inspired Audi RS6 and the supercharged 800-hp Lamborghini Huracan with a ski box on the roof. Well, he’s since traded the winter-ready Lambo for a practical four-seater to accommodate his busy lifestyle. 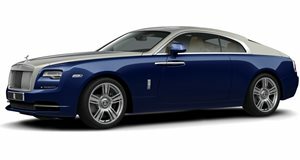 He considered getting an Audi RS6, Nissan GT-R and Ferrari FF, but settled for a Rolls-Royce Wraith. This might just be his craziest creation yet. Writing on his website, Olsson says that the original plan was to create a custom off-road Wraith with extreme winter tires, but his full-time commitment to his Vlog meant he didn’t have the time to bring the project to fruition. Like his Lambo, the Wraith, nicknamed George, has been fitted with a winter camouflage vinyl wrap, but as the summer months rolled in the roof rack was modified to carry a surfboard instead of skis and a huge set of spotlights were added. Built by Absolute Motors, “George the Rolls” has had some serious modifications under the hood. Powered by a twin-turbocharged 6.6-liter V12, this modified Wraith packs a whopping 810 hp and rides on a set of 24-inch forged rims. The suspension has also been lowered and tightened. Olsson admits that the outlandish car is an acquired taste and probably won’t get him invited to any Rolls-Royce events. Nevertheless, he certainly seems proud of his creation. “Who would have thought that you could have a race car sounding, smoke shooting, cage carrying monster machine with a RR badge in the front?” he wrote. “If someone showed me this car 15 years ago and said it was mine I would have laughed, no way that I would have been able to build something like that!” We’re inclined to agree – this is quite possibly the most insane Rolls-Royce we’ve ever seen. Be sure to check out the video above documenting George's 1,400-mile journey from Absolut Motors' shop in the Netherlands to Olsson's home in Spain. It's not every day you get to see a Rolls-Royce do some tire-shredding burnouts.